I began this performance in 2011 on a single soap box - a counterfeit of Andy Warhol's iconic Brillo Boxes. During this performance I rant about the importance of copying in art and social interaction, at the same time I hand out stamped copies of the text - The Truth Is A Copy. In 2012 I expanded on this work with Michael Meneghetti as part of our Performprint performance at the Fremantle Art Center. Michael and I kept expanding Performprint and in 2014 we had a major exhibition at The Meat Market venue of Arts House in North Melbourne. The space is cavernous and we were thrilled to develop Performprint in this location. 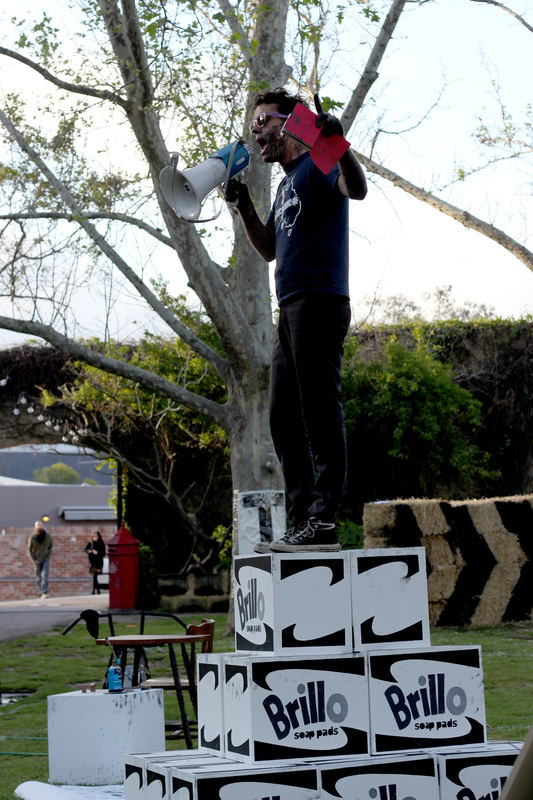 Among many other aspects of Performprint we exhibited a large scale Soap box performance. In which I stood on a small zigurat of Andy Warhol's Brillo Boxes and preached about the importance of the copy.